Getting ready for the holiday baking season? Check out this interview with McLean Magazine for their special on vínarterta! One of the most common markers of modern Icelandic North American identity is a seven-layered torte called vínarterta (vee-nar-terta), also popularly (mis)spelled “vinatarta” or “vinaterta.” For this English speaking and seemingly assimilated ethnic group, vínarterta is a remarkably consistent and popular symbol of ethnic identity. This torte is regularly served during special occasions, particularly at Christmas, weddings and public Icelandic festivals. Yet this obsession with dessert is a source of confusion for Icelanders visiting their cousins in Canada and the US. Vínarterta is neither a national cultural symbol nor the most popular form of dessert in Iceland and Icelandic recipes vary more in terms of ingredients. 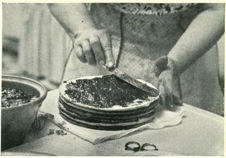 While most Icelandic North Americans would never dream of violating the sacred trinity of prunes, cardamom and paper thin cookie layers in their vínarterta, European Icelandic bakers use a wider range of fruits including strawberry and rhubarb to make a version of the torte known as randalín. Most often Icelandic-Canadian community members use recipes that have been passed down in the family to make this torte and condemn variation. The inclusion or exclusion of certain ingredients, including almond extract and cardamom, the use of frosting, and the number of layers are hotly contested issues. The Icelandic-American author Bill Holm described the sometimes fiery conflicts that arise over the “right” kind of vínarterta in his book, The Heart Can Be Filled Anywhere On Earth. The debates surrounding vínarterta recipes most often reflect community members’ dedication to preserving the original form of the dessert as it was prepared in Iceland in the late 1800s. Unlike other aspects of cultural life that have been radically transformed in Canada, including the adoption of anglicized names and the decline of the Icelandic language, the dedication to preserving vínarterta in its original form illustrates that community members understand it as a powerful and culturally significant way of connecting to the Icelandic past, while re-asserting their Icelandic identity in the present. Looking for a great vínarterta recipe? Try the version that made Jóna Peterson, of Bottineau, North Dakota, famous in 1949 when it was published in McCall’s Magazine’s monthly column, “The Best Cook in Our Town” (Text by Helen McCully) HERE. Thank you for your comment Lorraine- sounds like an interesting spin on the old version. to Manitoba. Even though there was a divorce of our parents, our mother still made sure we had vinarterta every Christmas. Hi Laurie! I think you’ve covered this fabulously here. The only thing I would like to add is that vínarterta, complete with the accent over the i, is a proper English word accepted by the Canadian Oxford Dictionary. (So is pönnukökur, by the way.) I have periodically had arguments at work over this word, but thankfully I have the dictionary, a copy editor’s final word on most things, to back me up. Thank you for this information and pronunciation! I’m a transplanted Minnesotan in Honolulu and Bea Ojakangas gets me by. I make the Cr My cardamom bread is superb if I do say so! But I love Vinarterta and am unable to link to the recipe via your reference. My computer screen comes up black – no idea why. Would you consider e-mailing your recipe to me? Thank you so much for the history write-up. It is still one of the few links left in my Icelandic heritage and always a great treat for my siblings. I usually make one or 2 a year around Christmas, but also whenever someone asks me to make something unique from my heritage. about the only difference in our church community was the ingredients for the cake layer from our Icelandic Lutheran Church Cook book that the ladies Auxiliary put together about 30 years ago. Great background info! Love it. My great-grandmother was Icelandic and my grandma made Vinarterta every Christmas. I use the version from the Saskatchewan Lutheran Church Women’s Centennial Cook Book (1967) contributed by Lydia Tagseth.